According to the data published by LinkedIn, sales function is still the most popular retail job. The relative size of sales has shrunk from a peak of 33% of all retail jobs in 2013 down to 29% in 2017. Something big is happening in retail. In 2013, there were almost 200,000 people who identified themselves as retail associates on their LinkedIn profile—just four years later, that number plummeted to 116,000. You can probably guess why: online shopping is more popular than ever while traditional brick-and-mortar stores are closing at record numbers. As just one example of this trend, Walmart, the world’s biggest retailer, recently announced it was closing over 60 brick-and-mortar Sam’s Club stores—and converting some of them into distribution centers for online shopping orders. Fewer stores mean fewer sales people needed on the floor—and more online shopping means more tech people required behind the scenes. With retail evolving so quickly, we wanted to see how the talent needs of the industry are changing, especially in regards to sales and engineering talent. The trends we found by analyzing LinkedIn data reveal that both roles in retail have changed significantly, even in just the last few years. 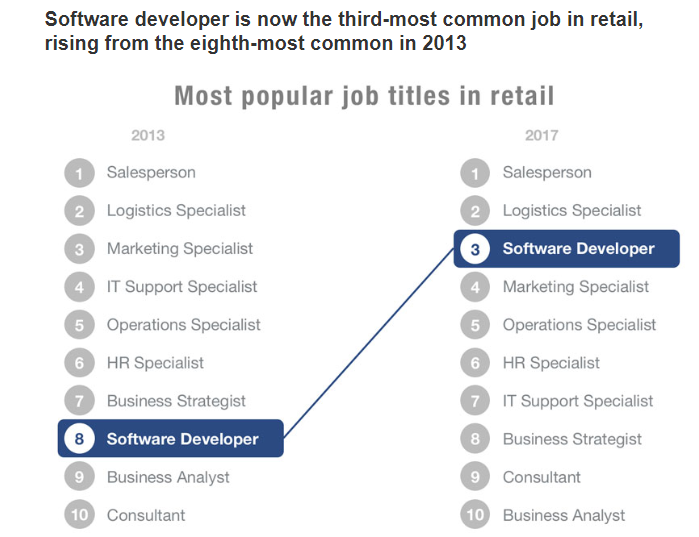 Suddenly, software developers are the fastest-growing job in retail—and the industry now finds itself competing for a new kind of talent. Here are the insights we found and what it means for employers and employees in retail and outside the industry. While the number of retail associates has fallen dramatically over the past few years, sales are still the most significant function of retail (and it’s not even close). Sales talent makes up 29% of the workforce in retail—that’s over twice the size of the second-biggest function, operations (13%). 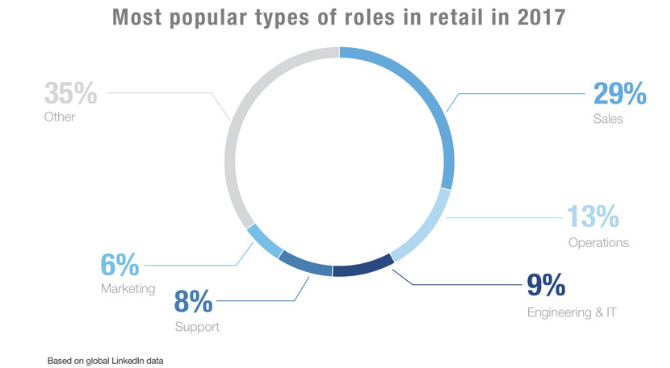 Engineering and IT talent are the third most common type of employee in retail, representing 9% of the industry, with support (8%), marketing (6%), and other roles rounding things out. Retail associates may feel like they’re on the unsteady ground. 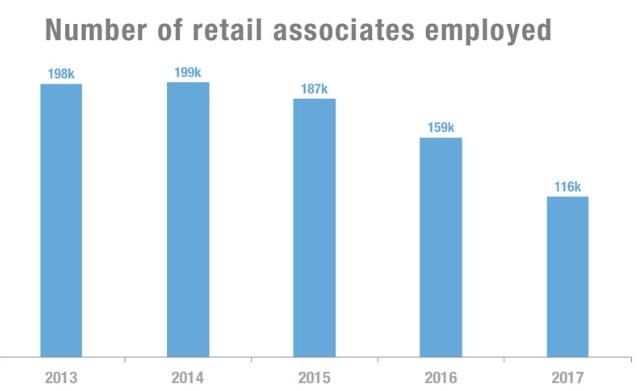 In the words of one former retail worker who lost her job and decided she’s done with the industry, “there is no job security anymore.” We saw that the number of retail associates had fallen quickly over the last four years—so we wanted to see where they’re going next. 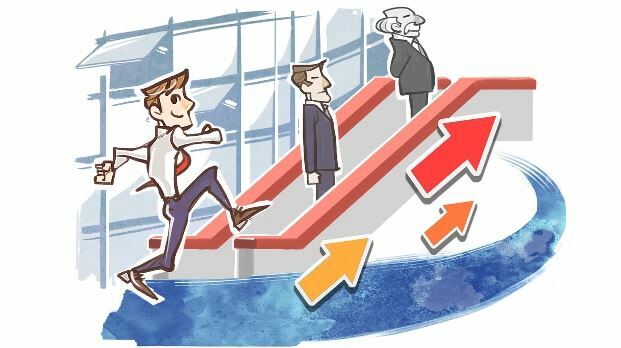 Of all retail associates who took on a new job title in the last five years (whether in retail or another industry), the most common next job was administrative employee followed by customer service specialist. The third most common move wasn’t to a job at all—it was back to school as a student. Food service represented the third-most common situation of retail associates leaving the position. The percent of retail employees in engineering roles rose from 7% in 2013 to 9% in 2017. That might not sound like a lot, but the speed of the increase is striking—especially when you look at job titles. 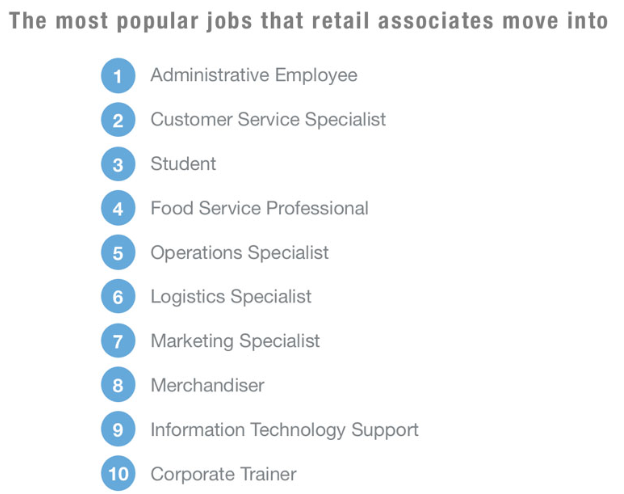 When analyzed the most common jobs in retail (grouping jobs into generic categories to control for slight differences in titles), there was one huge outlier. When you think “software developer,” you don’t usually think retail—but that may soon change. Sure, the salesperson is still the #1 job, but the increase in software developers is a shocking shift in just four years. With developers now the third-most common job in the industry, we wondered exactly what skills were most common among retail developers. Almost everyone knows the retail industry is shifting—the move to online shopping and the closure of many traditional stores is visible in our everyday lives. But the composition of the industry’s talent is shifting, too. The number of sales associates, traditionally the backbone of retail, is shrinking, as many looks for opportunities elsewhere. In their place, the e-commerce trend has brought an engineering boom—meaning retail is yet another industry competing for tech talent as it transforms itself (e.g., the finance industry is also rebranding itself in an attempt to attract more tech talent). The brick-and-mortar to e-commerce story is part of a much more significant trend towards tech skills, which makes for a fiercely competitive market among employers in retail and beyond. Insights on the retail industry’s workforce composition, hiring trends, popular job titles, and skills are drawn from LinkedIn’s aggregate member data. Functions are classes of job roles, inferred by job title. Job titles are standardized to control for slight variations. For this analysis, the retail industry comprises companies of at least 100 employees that sell general merchandise (e.g., supermarkets), sell specialty goods, or sell online as e-commerce businesses. We analyzed the skills of software developers at retail companies to find their top skills (by volume of members), fastest-growing skills (calculated by percentage of retail developers adding that skill in last 6 months), and most unique skills (calculated by comparing the percentage of retail developers with specific skills against the percentage of all software developers with those skills).